If I have to hear one more stupid excuse as to why Europe, China, Africa, or the North Pole is so much more ‘enlightened’ than we are, I’m going to lose it! A freakish video has emerged of a man receiving the kind of medieval style treatment that gave you nightmares when you learned about them on the History Channel. This particular method was used to drain his head of blood. According to reports, the antiquated process supposedly is used to treat headaches in traditional Chinese medicine. But while the treatments like this one have been around for hundreds of years, the one displayed in this video is so disturbing, it leaves viewers shaking their heads in disbelief. In the footage, the would-be patient is seen smiling and joking with a band wrapped around his neck. 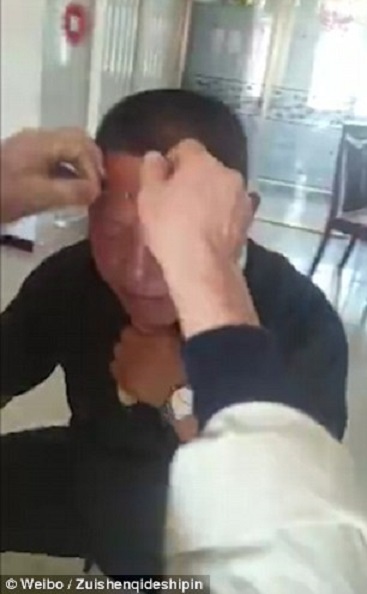 Another person, who appears to be the doctor, is then seen touching his forehead right before he lines up what appears to be a tube or needle, right on the guy’s forehead. That’s when things got a little bloody. As soon as the doctor punctured the man’s forehead, the blood came pouring out of it in a stream, landing in a bucket. We are not sure if the man is in pain, but judging by the squinting he is doing and the fact that there is now a hole in his head where there wasn’t one previously, I believe any viewer can understand why this method isn’t practiced in the West. This method is known for alleviating headaches, but whether it works or not, you would have to ask someone that’s done it. The video was posted to Chinese social media site Weibo where people have been appalled by what they saw.